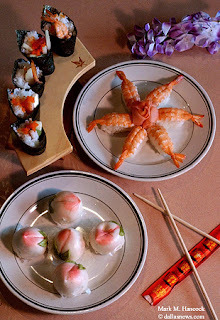 China Wang Buffet offers several chef specialties such as Seaweed Rolls (clockwise from top, left), Ebi Shrimp and Peach Shape Pockets at the restaurant in Lewisville on Thursday, February 27, 2003. Michael Clark (left) and Scott Thompson (right) shelter Michele Gifford (left to right), Marcella Ducsay and Christy Miller as they perform Ben Stevenson's "Four Last Songs" as part of the Fort Worth Dallas Ballet's "Three of Hearts" valentine repertory program at Bass Performance Hall in Fort Worth during a dress rehearsal on Thursday, February 13, 2003. 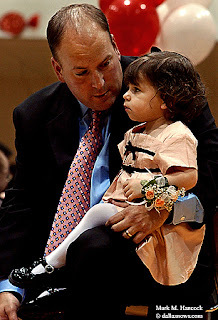 Kevin Mitchell of Grapevine talks to his 22-month-old daughter Macie Mitchell during a Valentine's family dance at the Grapevine Community Activities Center in Grapevine on Saturday, February 8, 2003. Martin's Parker Ryan (left) tries to dislodge Colleyville Heritage's Corey Howard (right) from his back during the Region II 112-pound wrestling championship at South Grand Prairie High School on Saturday, February 8, 2003. Ryan won the match. Every time I see this image, it takes me a moment to mentally untangle which limbs belong to whom. I like the pained expression on the nearest wrestler's face. Competitive wrestling makes for great facial expressions and strange body positions. Matt Sansone of Arlington Martin puts pressure on Trinity's Roger Miller during the Region II 135-pound wrestling championship at South Grand Prairie High School on Saturday, February 8, 2003. 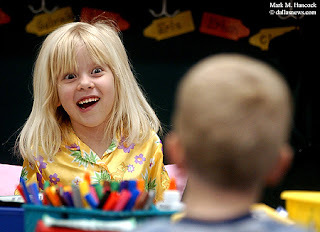 Glenhope Elementary School kindergartener Summer Hamilton makes a face at Eric Collins during a pizza, pillow and movie party at the school in Colleyville on Friday, February 7, 2003. Argyle High School brothers Jeff (left) and Josh (right) Martz pose for a portrait at the school on Wednesday, February 5, 2003. They will both go to the regional wrestling championships. Josh, a junior, wrestles at 130 pounds and has made it to state before. Jeff, a freshman, competes in the 135-pound weight class. Believe it or not, this is shot in a well-lit gym. It's shot at f/22 at 1/500th second, so the available light isn't even on the radar. However, it's really hard to frame shots for something you can't see (the reflection). DeLorean McGee (left) applies makeup onto Nevin Pollard (right) as Grand Prairie High School Ninth Grade Center students prepare for a performance at the school on Wednesday, February 4, 2003.